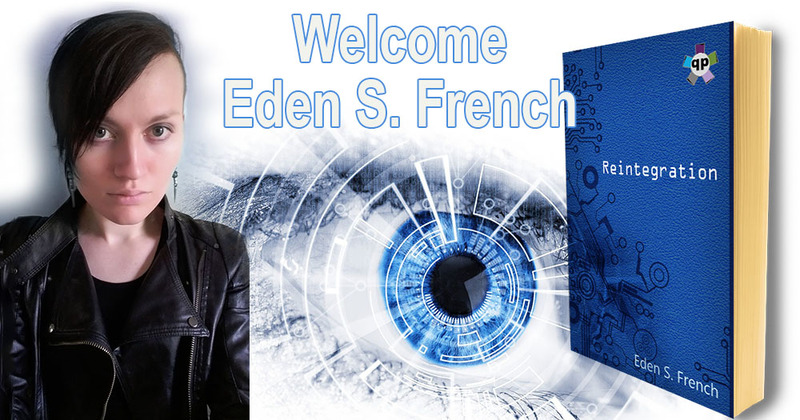 Ylva Publishing’s new imprint, Queer Pack, is delighted to announce the signing of Australian author Eden S. French. In 2017, Queer Pack will republish Eden’s riveting, world-building, sci-fi novel, Reintegration, which she first self-published late last year. Reintegration follows streetwise cyborg Lexi Vale, who negotiates deals with crime lords in an anarchic city. Giving her the edge is a unique mind-reading implant—but now its creators want their technology back. Lexi finds refuge and an emotional connection with an unlikely group of rebels and outsiders. Queer Pack embraces characters and authors with identities beyond the usual gay or lesbian. Eden, who describes herself as a queer, non-binary woman, is an excellent addition to our pack, given Reintegration includes a diverse cast of unique characters, many of whom identify in the space between traditional labels. Eden is also the author of Fruit of the Golden Vine (Bella Books, 2016), and The Diplomat (Bella Books, 2015), a fantasy romance which won a 2016 Alice B. Walker Lavender Certificate and a 2016 Goldie Award for Debut Author. When Eden’s not dreaming up incredible new worlds, she can be found doing her PhD in English at the University of Tasmania, and working with noted romance scholar Lisa Fletcher on a study into transgender representation in popular romance fiction.